In William Kent Krueger’s “finest work” (Michael Connelly), detective Cork O’Connor unravels a mystery for his old friend Henry Meloux, only to get caught in the blistering crossfire of jealousy and revenge. Happy and content in his hometown of Aurora, Minnesota, Cork O’Connor has left his badge behind and is ready for a life of relative peace, setting up shop as a private investigator. But his newfound state of calm is soon interrupted when Henry Meloux, an Ojibwe medicine man and Cork’s spiritual adviser, makes a request: Will Cork find the son that Henry fathered long ago? With little to go on, Cork uses his investigative skills to locate Henry Wellington, a wealthy and reclusive industrialist living in Thunder Bay, Ontario. When a murder attempt is made on old Meloux’s life, all clues point north across the border. But why would Wellington want his father dead? This question takes Cork on a journey through time as he unravels the story of Meloux’s 1920s adventure in the ore-rich wilderness of Canada, where his love for a beautiful woman, far outside his culture, led him into a trap of treachery, greed, and murder. The past and present collide along the rocky shores of Thunder Bay, where a father’s unconditional love is tested by a son’s deeply felt resentment, and where jealousy and revenge remain the code among men. As Cork hastens to uncover the truth and save his friend, he soon discovers that his own life is in danger and is reminded that the promises we keep—even for the best of friends—can sometimes place us in the hands of our worst enemies. 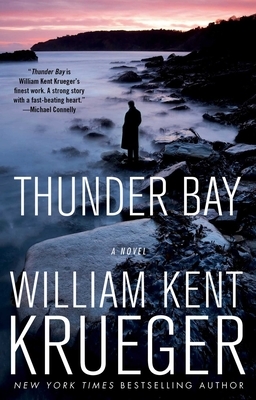 "Thunder Bay is William Kent Krueger's finest work. A strong story with a fast-beating heart, this is the kind of novel that will bring many new readers knocking on Cork O'Connor's door. Count me as one of them." "Thunder Bay has everything that William Kent Krueger's longtime fans have come to expect in this lovely series - and everything it needs to entice new readers into the fold. Steeped in place, sweetly melancholic in tone, it braids together multiple stories about love, loss, and family. The result is a wholly satisfying novel that is over almost too soon." "William Kent Krueger has one of the most fresh and authentic voices in crime fiction. In Thunder Bay he uses it to tell a resonant, gripping story. Don't miss this book."